Donald Rose has no teeth, but that’s not his biggest problem. A camouflage hat droops over his ancient, wire-framed glasses. He’s only 43, but he looks much older. I met him one day in October as he sat on a tan metal folding chair in the hallway of Riverview School, one of the few schools—few buildings, really—in the coal-mining town of Grundy, Virginia. That day it was the site of a free clinic, the Remote Area Medical. Rose was there to get new glasses—he’s on Medicare, which doesn’t cover most vision services. Remote Area Medical was founded in 1985 by Stan Brock, a 79-year-old Brit who wears a tan Air-Force-style uniform and formerly hosted a nature TV show called Wild Kingdom. Even after he spent time in the wilds of Guyana, Brock came to the conclusion that poor Americans needed access to medical care about as badly as the Guyanese did. Now Remote Area Medical holds 20 or so packed clinics all over the country each year, providing free checkups and services to low-income families who pour in from around the region. When I pulled into the school parking lot, someone was sleeping in the small yellow car in the next space, fast-food wrappers spread out on the dashboard. Inside, the clinic’s patrons looked more or less able-bodied. Most of the women were overweight, and the majority of the people I talked to were missing some of their teeth. But they were walking and talking, or shuffling patiently along the beige halls as they waited for their names to be called. There weren’t a lot of crutches and wheelchairs. Yet many of the people in the surrounding county, Buchanan, derive their income from Social Security Disability Insurance, the government program for people who are deemed unfit for work because of permanent physical or mental wounds. Along with neighboring counties, Buchanan has one of the highest percentages of adult disability recipients in the nation, according to a 2014 analysis by the Urban Institute’s Stephan Lindner. Nearly 20 percent of the area's adult residents received government SSDI benefits in 2011, the most recent year Lindner was able to analyze. Just about everyone I spoke with at the Grundy clinic was a former manual worker, or married to one, and most had a story of a bone-crushing accident that had left them (or their spouse) out of work forever. For Rose, who came from the nearby town of Council, that day came in 1996, when he was pinned between two pillars in his job at a sawmill. He suffered through work until 2001, he told me, when he finally started collecting “his check,” as it’s often called. He had to go to a doctor to prove that he was truly hurting—he has deteriorating discs, he says, and chronic back pain. He was turned down twice, he thinks because he was just 30 years old at the time. Now the government sends him a monthly check for $956. Each classroom at Riverview School had a different specialist tucked inside—in one, an optometrist measured eyes with her chart projected on the classroom wall. She showed me a picture she took in a nearby town of a man who, unable to afford new glasses and rapidly losing eyesight, had taped a stray plastic lens over his existing glasses. The clinic had brought along two glasses-manufacturing RVs where technicians could make patients like Rose a fresh set of glasses, including frames, in just a few hours. As for his teeth? Rose’s diabetes loosened them. “They went ahead and pulled them all,” he said. He assured me that being toothless was not as grave a life-change as the toothed might imagine it to be. In October, the sun-dappled mountains blazed with red and orange as the leaves turned. If you wanted to send someone a postcard to convince them of the merits of Virginia, this would be it. But if this place has the scenery of the Belgian Ardennes, it has the health statistics of Bangladesh. People here die about five years earlier than they should. About a third of people smoke, and a third are obese. A quarter of the people live in poverty, compared with about 11 percent in the rest of the state. These Appalachians, many of them former coal miners, are among the nearly nine millionAmerican workers receiving disability payments today, compared with 1.4 million in 1970. Spending on the program has risen nine-fold over the past four decades. Clusters of recipients can be found from California to Maine, though as Lindner points out, the states with the highest numbers tend to be in the South and Southeast. Critics say the program’s expansion is partly driven by Americans who are perfectly capable of working but are unwilling to do so. Since the mid-1980s, government spending on the elderly and disabled has ballooned, even as tightened eligibility rules have slashed welfare aid for needy mothers and children. Even advocates of “big-government”-style welfare acknowledge that some people use the program because it’s the only form of income available to them. At the clinic, people who were themselves on disability complained about others who they saw as lazy fakers who milked the system. But visiting a place like Grundy reveals a more complicated picture. There are undoubtedly some who exaggerate their ailments in order to collect their checks. But many of the coal workers here have experienced horrific on-the-job accidents and can’t go back to the mines. Other residents have been battered by diabetes, obesity, and tobacco. Others still suffer from severe depression and intellectual disabilities that would preclude most kinds of work. And most importantly, there are no other options here: no orthodontist’s office where someone can work the front desk; no big firms brimming with entry-level secretarial jobs. It’s not even clear how a person would go about calling around for a job here: My iPhone stopped working a few miles outside the county line. Few white-collar people understand the degree to which manual labor chews up workers’ bodies. And in Grundy, there’s nowhere for them to go afterward. “Here you have a Pandora's box of every social issue that might contribute to disability,” said Martin Wegbreit, the director of litigation at the Central Virginia Legal Aid Society. Before coming to Richmond in 2004, Wegbreit worked in southwest Virginia for nearly 20 years. The place had its boom years. Coal first came in the 1930s, displacing poor farmers who tilled the tough mountain dirt. In the 1970s, United Coal expanded rapidly by snapping up cheap land all across Buchanan county. A 1978 New York Timesarticle describes a “never-ending rush hour” on Grundy’s lone highway as convoys of coal trucks with names like “The Lord Is My Leader” roared through town. The Island Creek Coal Company made plans for a development of 1,600 Swiss-chalet-style houses on a nearby hilltop. The population of the county has shrunk by about 15,000 people since that year. In May alone, 188 workers were laid off in a mine near Grundy. The industry has been slammed by the newfound natural gas reserves and is expected to contract further by 2020. Still, coal remains the largest employer in Buchanan, and its heavy impact continues to be felt even by those who no longer work in the mines. Other injuries are even more gruesome. “I’ve had men who had their hand trapped, fingers crushed, fingers amputated,” Gifford adds. “One man didn't duck in time, so a cable pulled him off the mining car and he suffered paralysis in both legs.” Harris, the law professor, says a former student of hers worked as a coal miner until he was trapped in a collapse and had to have his foot amputated. In the school’s cafeteria, I met a middle-aged man named Robert who told me he began working in the mines when he was 8 years old to help his family. (He asked me to use only his first name.) In 1999, he and some co-workers were repairing a piece of machinery and a metal chunk the size of a small table swung off a hook and came crashing down onto him, taking the entire apparatus down with it. "My forehead hit the ground, and the metal hit the back of my head,” he said. “I had a hard hat on. The first time it hit me, it knocked my hard hat off. The second time, it knocked my head into the ground and landed on top of me and bent me over." After the initial recovery came the bad headaches and the prescription painkillers that he couldn't tolerate. An x-ray revealed a herniated disc. He tried to go back to work three times, he says, but after four or five days back on the job, he’d be puking from the pain. It took him five years to get his disability check. He now says he and his wife make about $2,000 a month from disability. Vicki was also applying for disability after quitting her job as a nursing assistant. Years of lifting 300-pound men, she said, inflamed the arthritis and bone spurs in her spine. She doesn't have health insurance, which is why she comes to clinics like this. The couple had been there since 4 a.m. Working in a mine has gotten safer over the years. But even if a coal worker manages to escape a freak accident, standing in clouds of coal dust can be treacherous for the lungs over time. In a back room of the elementary school, I met with Joe Smiddy, a retired pulmonologist who now volunteers for Remote Area Medical doing chest x-rays. He showed me an image of a pair of lungs mottled with tiny white specks—each of them a piece of coal dust with a scar around it. This is coal workers' pneumoconiosis, or black lung disease. “This gentleman has a lung full of dust,” he said. No matter how much gunk is clogging their airways, Smiddy said his patients often avoid complaining to their bosses or letting on that they’re sick. Unless, that is, they’re ready to go on disability. Compare all of this with Arlington County, 400 miles away in the northern part of the state, which has one of the nation’s lowest rates of disability. Only 1 percent of people in Arlington are on disability, and it’s regularly ranked one of the overall healthiest (and richest) counties in the nation. Here, there are well-paved bike routes and a Metro-accessible Whole Foods. People complain when they can’t take their tiny dogs into Starbucks. Virginia, in other words, is a state divided not only by politics, professions, and mountains, but also by how run-down its citizens are. While Buchanan county’s fortunes have been inextricably tied to coal, those of Northern Virginia are hitched to the government. A large portion of its residents belong to the vast army of contractors, lobbyists, lawyers, PR people, and other auxiliary workers who orbit the federal government and rake in generous salaries for their efforts. As Dylan Matthews pointed out in the Washington Post, there’s been a $1.7 billion increase in lobbying spending between 1998 and 2010 alone, which correlates neatly with the rise in incomes of Washington-area residents. What’s more, the eye-popping growth of contracting in the 90s that was intended to downsize the government resulted in private workers doing the same work for exponentially more money. Northern Virginia counties are now home to these wealthiest Washingtonians. One day recently I visited an Arlington lululemon. Inside, a man gazed at a wall of “performance” tank tops selling for $58. He hailed a beanie-clad associate and said he needed help finding a gift for his girlfriend. She does “something with a machine,” the boyfriend said. “I’m going to guess,” the boyfriend said confidently. Unsurprisingly, Buchanan county has no similar high-end shops. In 2011, it got a Wal-Mart that employs 230 people. At minimum wage, an entry-level job there pays as much as disability would, but even retail jobs require standing for long hours. I searched Monster.com for jobs nearby, and most of the 78 listings were in retail or home healthcare. Only two of the positions were actually in Grundy. “We have no factories, we have nothing here,” said Celeste Barrett, a social worker in Grundy. “Coal mining is all we have.” Barrett was one of two women from the local department of social services sitting in front of tables bearing heaps of donated clothes. The goods were destined for the families of out-of-work miners, they said. An outmigration of the young and talented has left behind an aging population that is ill-equipped to deal with a changing economy. Thirty-two percent of Buchanan's residents never graduated from high school, compared with 15 percent nationwide. What's more, the same landscape that makes the area so gorgeous can also, perversely, make it harder to stay healthy. There are only a few paved roads into the county, and there was no grocery store until recently. There’s no public transportation and few sidewalks. The health problems cascade from there. The economy is built on physically grueling jobs. An injury causes pain, which causes depression. Depression makes it harder to work. People gain weight. The weight gain leads to sleep apnea and sometimes to diabetes. Diabetes can exacerbate vision problems. Those who argue that the disability system has become choked with exaggerated claims are not entirely wrong. In 2011, the Wall Street Journal reported on David Daugherty, a West Virginia judge who had seemingly rubber-stamped approval for all but four of the 1,284 disability appeals that came before him. He appeared to be colluding with a lawyer named Eric Conn, who had advertised his services on billboards as “Mr. Socialsecurity” and sometimes brought “an inflatable replica of himself to events.” It’s faster for disability judges to approve a disability claim than to reject one, so it’s easy to see how less-than-deserving cases would sneak through. To sign up, applicants first state their disabilities and the names of their doctors. Each application is reviewed by state officials and sometimes by an independent doctor. Two-thirds of applicants are rejected after this step because they lack medical documentation that their ailments will keep them out of work for at least a year. From there, an applicant can appeal, and a different official will review his or her paperwork. After that, another 11 percent of applications are approved. The rejected cases are seen by administrative judges in courtrooms across the country. According to a recent Washington Postinvestigation, the entire process can take years. If they make it through, beneficiaries will receive $13,740 annually, on average. The problem is, even if society were to decide that there should be fewer people on disability, that the system has become too bloated with sneaky pretenders, it isn’t clear what a fifth of the population of Grundy would do to survive. It’s entirely possible that some of the town’s residents are faking their disability claims, but it’s hard to imagine that most of them are. 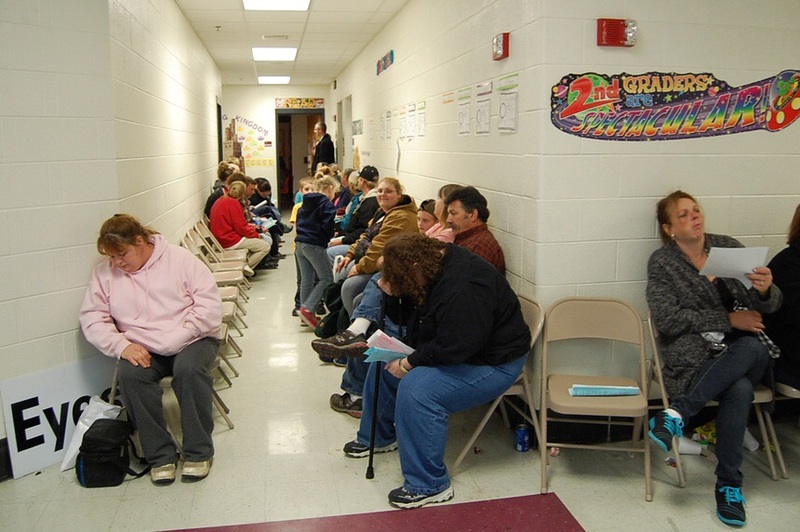 People who are rolling in undeserved government dough generally don’t line up at the crack of dawn to get their teeth fixed in an elementary school cafeteria. Enough applications get through that disability benefits provide an economic safety net to Buchanan county residents. But the high number of recipients also depresses the area further by keeping new businesses away. Companies aren’t eager to hire sick, worn-out miners. Once people get on disability, they usually don’t go back to gainful employment. Though they’re not counted in unemployment statistics, functionally, they become like the long-term unemployed—falling into an economic hole from which it’s notoriously hard to claw out. Idleness, meanwhile, further depletes bodies and minds.The rate of depression is 19 percent among people who have been unemployed for a year, compared to just 10 to 11 percent for people who went without jobs for just a few weeks. Even though they don’t face the same financial strains as the long-term unemployed, people on disability still suffer the negative health effects of being jobless. Researchers have also found high rates of depression among recipients of welfare, for example. “Once you're on the couch, your muscles become weak, you're going to gain weight, you're not physically capable of going back in the coal mine,” Smiddy said. A lack of work has been shown to increase the risk of premature death significantly, particularly for men. The problem, as Smiddy sees it, isn’t just that the economy is limited, or that the region’s education and medical systems could use an overhaul. The county’s health has been so poor for so long, he says, that locals have set their expectations too low. And once everyone—the people, their employers, their doctors, the government—accepts that bleak vision, it hardens into reality. It makes it so there’s no life after coal.